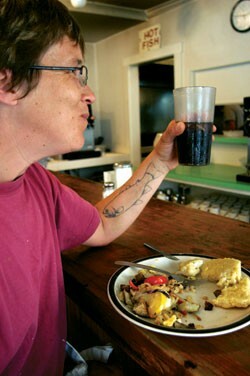 Few Vermont eateries attain the fame of Plainfield’s River Run, which Mississippi-born chef Jimmy Kennedy opened with his then-wife, Maya, in 1991. Over the next 18 years, the barbecue joint — which brought fare such as catfish, hush puppies and fried dill pickles to central Vermont — racked up accolades. He’ll have to find a new place to get old. Last year, when Ignacio Ruiz bought River Run, he had a two-prong plan: Kennedy would keep making pancakes and cheesy grits in the a.m., while Ruiz would prepare the cuisine of his native country, Spain, in the evening. For seven months, that’s what they did. Kennedy no longer had to deal with the administrative aspects of owning a restaurant, which freed him up for other pursuits such as professional competitive fishing, but his presence behind the griddle kept longtime customers such as Pfeiffer happy. Ruiz introduced paella, garlic shrimp, meatballs in wine sauce and seafood stew in the p.m.
Two weekends ago, on a whim, Ruiz decided to eliminate breakfast, change the eatery’s name to Tasca and serve Spanish fare at lunch and dinner seven days a week, plus Sunday brunch. “It was a total impulse, a very Spanish impulse,” he says with a chuckle. The spot will reopen this week with its new name, after a few renovations. Why? The early-morning hours were reportedly costing the restaurant more than it brought in. “Where we stand right now, dinner has kept River Run alive, economically,” Ruiz says. He also believes the restaurant’s split personality was confusing customers. The BBQ expert — who keeps busy working as a spokesperson for Cabot — was out of town at a fishing tournament when he received a text message from Ruiz suggesting he get in touch. Because of the rigors of the competition, Kennedy says, he didn’t notice the text until he’d already heard secondhand the news of River Run’s closing. To remedy the situation, Kennedy will cook one last River Run breakfast on August 8. “We’ll give everyone a chance to come back in one more time to get their pancakes and bacon or catfish,” he says. Spector recalls Mamet saying River Run was where “poets and farmers eat together.” But he contends that can happen at a tapas place, too.